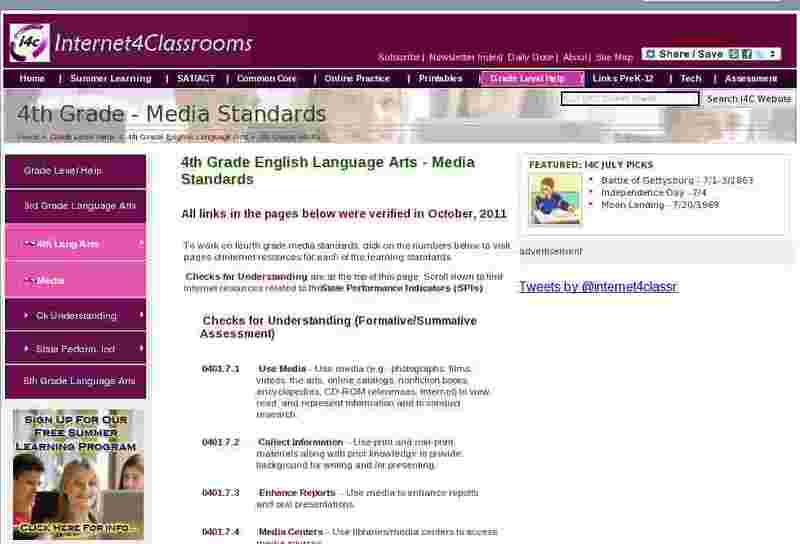 To work on fourth grade media standards, click on the numbers below to visit pages of internet resources for each of the learning standards. 0401.7.1 Use Media - Use media (e.g., photographs, films, videos, the arts, online catalogs, nonfiction books, encyclopedias, CD-ROM references, Internet) to view, read, and represent information and to conduct research. 0401.7.2 Collect Information - Use print and non-print materials along with prior knowledge to provide background for writing and /or presenting. 0401.7.3 Enhance Reports - Use media to enhance reports and oral presentations. 0401.7.4 Media Centers - Use libraries/media centers to access media sources. 0401.7.5 Effects of Media - Develop an awareness of the effects of media (e.g., television, print materials, Internet, magazines) on daily life. SPI 0401.7.1 Appropriate Source - Select the most appropriate and reliable media for accessing information, writing a report, or making a presentation. SPI 0401.7.2 Main Idea - Identify the main idea in a visual image. SPI 0401.7.3 Enhance Presentation - Choose the most effective medium to enhance a short oral presentation (e.g., still pictures, model, diorama, PowerPoint, recording). SPI 0401.7.4 Pre-Modern Media - From a list of media, identify the medium that is available to you that was probably not available to previous generations.